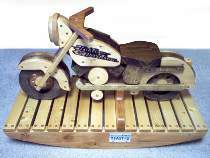 Make this motorcycle rocker from 3/4" pine and 1/2" plywood. Motorcycle measures approx. 35"L not including rockers. All patterns drawn FULL SIZE. Photo courtesy of Craig Warmuth.